Mash the bananas to make a puree. Add honey, chopped dates, oil and mix it in an electric mixer or with a hand whisker. In another bowl whisk together, wheat flour, cinnamon powder, baking powder, baking soda, and salt. Now mix the dry ingredients with wet ingredients and fold gently with a spatula. This will make a thick dough. Now add the seeds/chopped walnuts. Save few for topping. Take a loaf tin. Lightly brush it with oil. Arrange the butter/parchment paper in it. Pour the dough in the tin and spread it evenly with the help of a spatula. Sprinkle the saved walnuts on the top. Preheat the oven 180 degrees C for 10 mins. Place the tin on the middle rack of the oven. Bake for 20 mins. Check by inserting a knife in the middle of the loaf. If it comes out clean, the loaf is ready. Otherwise, bake it for another 5 mins. Take it out of the mold after 5 mins. It is ready for slicing and to be enjoyed with tea. Peanut butter spread will make it more delicious. 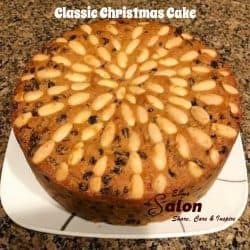 This is Delia’s original Christmas cake from her first book – a combination of her grandmother’s, mother’s and a few tweaks from Delia. Armagnac or brandy to ‘feed’ the cake. 20 cm round loose-based cake tin and grease the base and sidelined plus some baking parchment. Tie a double band of brown paper around the outside of the tin for extra protection. 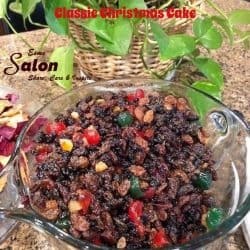 You should get the pre-soaking ingredients ready the night before you make the fruitcake. Give it 12 hours or more to soak. Put all the fruits in a bowl and mix them with the brandy, cover with a cloth and leave them to soak for a minimum of 12 hours. When you’re ready to cook the cake, preheat the oven to 140C, gas mark 1. Now all you do is sift the flour, salt and spices into a very large roomy mixing bowl then add the sugar, eggs, treacle (warm it a little first to make it easier) and butter and beat with an electric hand whisk until everything is smooth and fluffy. Now gradually fold in the pre-soaked fruit mixture, chopped nuts and finally the grated lemon and orange zests. 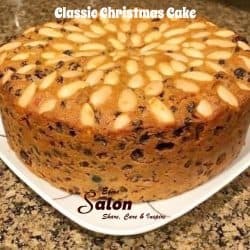 Next, using a large kitchen spoon, transfer the cake mixture into the prepared tin, spread it out evenly with the back of the spoon and, if you don’t intend to decorate the cake with marzipan and icing, lightly drop the blanched almonds in circles over the surface. Finally, take a double square of baking parchment with a $1-sized hole in the center (for extra protection during the cooking) and place this NOT on top of the mixture itself but on the rim of the brown paper. Bake the cake on the lowest shelf of the oven for 4 hours until it feels springy in the center when lightly touched. Sometimes it can take 30-45 minutes longer than this, but in any case don’t look at it for 4 hours. 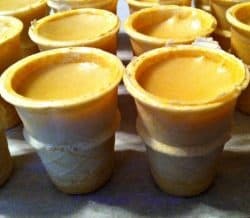 When it’s cold, ‘feed’ it by making small holes in the top and bottom with a cocktail stick or a skewer and spooning in a couple of tablespoons of Armagnac or brandy, then wrap it in parchment-lined foil and store in an airtight tin. You can now ‘feed’ it at odd intervals until you need to ice or eat it. 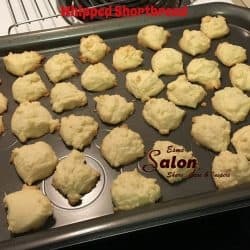 This recipe was supplied by the women’s Jewish Zionist league when they were collecting money for the war in the 70’s. I bought 4 books and gave one to my mom, mother-in-law, sister and myself. My book, unfortunately, was burnt when I had my house fire. Fortunately, for me, my sister’s copy is nearby and so I am still able to have the many great recipes supplied by so many great Jewish women cooks. Jeanette Cohen promised that you will never try any other method of cooking your turkey again. 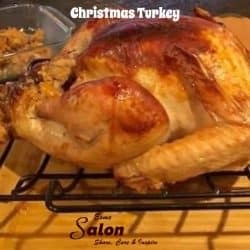 For me, this has been true and I have been cooking mine using her method for 39 years on Thanksgiving and Christmas and have past this recipe to many friends whom all use it too. Thank you, Jeanette Cohen, wherever you may be. 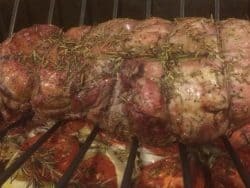 Place turkey in a large roasting pan. Stuff with the celery and the carrots cut lengthwise, Or, use your own stuffing recipe and leave the carrots and celery around the turkey. Mix all other together and pour over turkey. Bake uncovered in a 375 oven for 3 hours. The skin will crisp and the meat will be moist, exactly as a turkey should be. 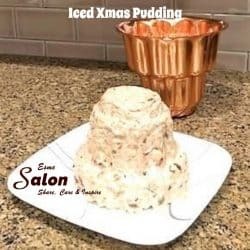 Iced Christmas Pudding. 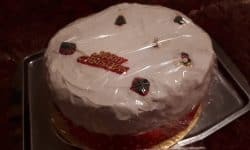 I have not had time to decorate the finished product yet, but you dust it with icing sugar, cherries, and whipped cream. Put milk, marshmallows, coffee, and cocoa into a saucepan. Heat gently until marshmallows are nearly melted. Allow cooling. Meanwhile, mix the dried fruit with sherry. Allow to stand for 30 minutes then add to marshmallow mixture with diced cherries and nuts. Freeze for a short time until slightly thickened. Fold the whipped cream into this mixture and pack into a chilled basin. Freeze until firm. 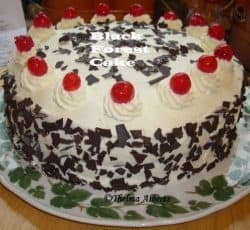 Turn out decorate with cherries and serve with more whipped cream (flavored with brandy and sweetened with icing sugar. To vary: use 2 tablespoons brandy or kirsch in place of sherry. If you like a stronger coffee flavored ice cream add more coffee. I made this a couple of years back. 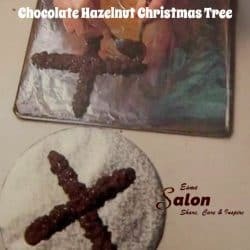 Below are photos of preparing the chocolate crosses in which to build the tree and the final photo of the finished piece. I am making another one this year. Grease 4 oven trays; line each with baking paper. Mark nine crosses, measuring 7 cm, 9 cm, 11 cm, 13 cm, 14 cm, 15 cm, 16 cm, 17 cm and 18 cm on trays, leaving about 3 cm space between each cross. Mark an 18 cm cross on cake board. Combine chocolate and hazelnuts in a medium bowl. 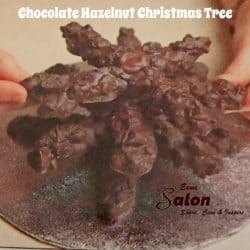 Drop teaspoonfuls of the chocolate mixture along all the marked crosses to make branches; refrigerate several hours or overnight. Drop about a teaspoon of the extra melted chocolate into the center of the 18 cm cross on cake board; position the 18 cm branch on top, moving it around until the best position is found. Assemble the remaining eight branches in pairs, starting from the largest remaining branch and finishing with the smallest, using about a teaspoon of the extra melted chocolate in the center of each crossed pair; refrigerate until set. Secure each pair to the next with a little bit of melted chocolate (if the branches look a little uneven, support them underneath with a matchbox or cardboard). 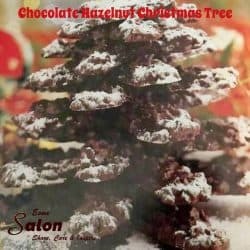 Secure Brazil nut to center of the smallest branch with a little bit of melted chocolate; drizzle remaining melted chocolate over nut to cover it in chocolate. Refrigerate until chocolate sets between branches. 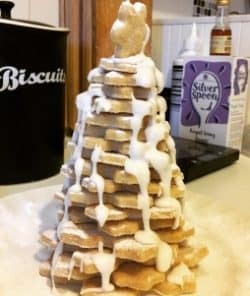 Store tree in the refrigerator until required; dust with sifted icing sugar. 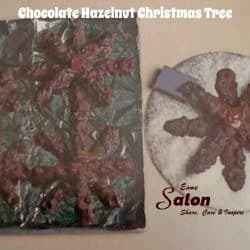 This tree takes a little time to make, but it is delightful to look at and delicious to eat. The Christmas tree can be made two days ahead. Bring out this tree with the coffee, suggesting to your guests that they snap off bits of the branches. Or, for an impressive gift, wrap the whole tree in cellophane and deliver it on the day. This is a great centerpiece for a table. 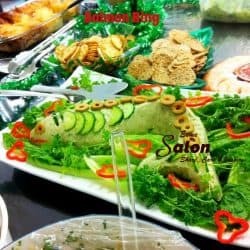 I used the green dye in the photo as I made this dish for a staff celebration of St. Patrick’s Day. Normally I do not add any green die and the red salmon gives the molded fish a nice shade of pink. Drain and flake salmon and season well. To juice of salmon add lemon juice, parsley, olives, onion, and vinegar. Dissolve gelatin in hot water and whip cream stiffly. Add tomato sauce, juice mixture and gelatin to salmon. Pour into mold, chill and turn out when set. Place salmon mold on a bed of lettuce. Decorate with olives for eyes, lemon slices in the tail and for scales on the fish, a slice of red pepper for mouth and circles for decoration on the lettuce bed, and whatever else you wish. Combine the mixed peel, sultanas, almonds, and cherries. Melt the butter, sugar, syrup and lemon juice in a saucepan. Shake the fruit mixture in the flour and stir into the mixture in the saucepan. Drop by teaspoonful’s onto an oiled baking sheet and leave plenty of room to spread. Flatten slightly with the back of a wet spoon. Bake 8 to 10 minutes in a 350 deg. Oven. 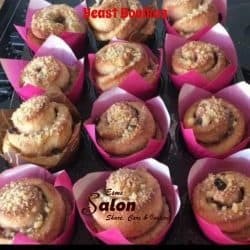 Allow them to cool for a minute then lift with a spatula onto a cake rack. Melt the chocolate over hot water and ice the flat undersides with the chocolate. Wiggle a fork through the chocolate the make some lines. 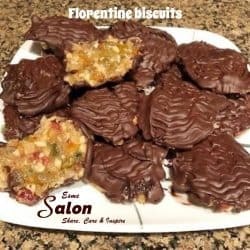 These Florentines keep very well. That is if you don’t have a partner with a sweet tooth and can’t stop eating them. Place 1 cup warm water in a separate bowl & sprinkle over the yeast. DO NOT STIR. Knead the dough again, then recover and allow to stand. Repeat this one more time then place on a floured surface and divide into 4 even pieces. Roll up and cut into 4 cm thick rounds. Press or pinch the bottoms of each round closed, brush the open cut side with more melted butter and sprinkle with streusel. Place the rounds in the VERY greased muffin tray and bake for approximately 15 minutes. 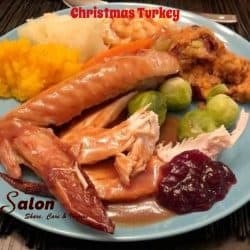 Wanting a low carb meal to serve a hungry man/ woman, one that looks festive and has a kick to satisfy a dieting tum. 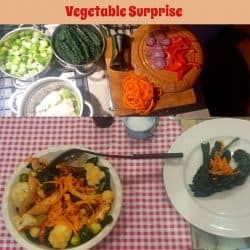 Try my vegetable surprise. With Chicken or turkey for carnivores and without for vegetarian or vegans. Prepare all veg for steaming. Except for onions and peppers which you soften in a tablespoon of olive oil. ( add lots of mushrooms for Vegetarian option). Choose the best fowl breast, trim and skin then long slice and pan fry. This one breast will feed two people. In the juice of the fowl add an index fingernail amount of Harrissa two lengths of tomato puree, one garlic clove, two teaspoons olive oil; sea salt to taste. A glug of stock if more liquid is required to cook low and slow until amalgamated, drop a walnut size knob of butter and mix until glossy. Taste mixture and if too hot add another teaspoon of Agave nectar to taste. Simmer cooked Fowl, peppers onions and peppers while veg steams. Then fold all together in the hot pan cover and leave on a very low heat to allow juices to absorb. Then serve. This is filling tasty and only 480 calories per portion as served. Schwarzwäldertorte or Schwarzwaeldertorte is a German name of a Black Forest cake. Now it is time for me to be here again especially that the Christmas Season is approaching. 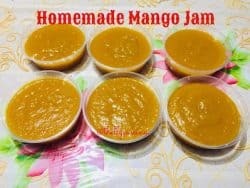 I am here again to share some delicious recipes I have created while I am vacationing in my hometown in the Philippines. Besides that, I want to join an #SIPBChallenge. SIPB means Sharing, Inspiring, Promoting Bloggers, a Facebook group created by Esme Slabs. Whip for 10-12 minutes; batter will be shiny and form peaks. Optional- Chill dough overnight (you can keep for a few days in the fridge). Before baking, take out and leave at room temperature for 1 hour, whip it up again in the mixer for about 5 minutes. 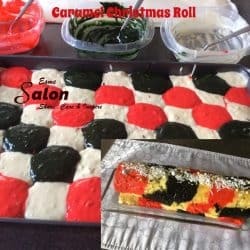 This option allows you to roll and shape the cookies. Still, melt in your mouth! Watch them carefully they can burn quickly. 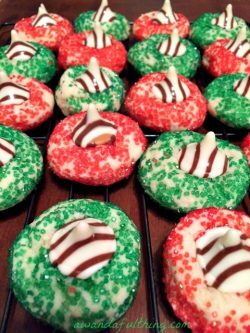 When removed from the oven allow them to cool for about two minutes on the cookie sheet, carefully move them onto a cooling rack with a spatula. Put the dry ingredients together in a mixing bowl. Make a hole in the middle and add vegetable oil and the eggs inside. 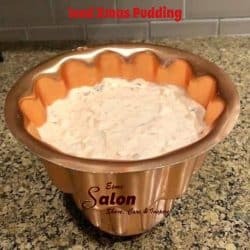 Blend the mixture in an electric mixing bowl and blend until it is fluffy. Then add the cooked and mashed pumpkin in the mixture. Blend well and put the batter in a medium size baking tin with a parchment paper in it. Boil the water in your steamer. 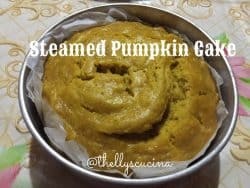 Then slowly put the baking tin filled with pumpkin batter on the steamer with moderate heat. Wrap the cover of the steamer with a clean white cloth before covering the steamer. The cloth hinders the falling of the steam water into the cake. Steam for about 45 minutes or until done. 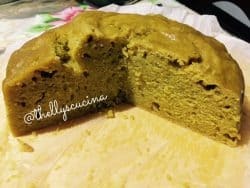 You can cover this steamed pumpkin cake with Christmas butter icing or a glaze as you wish. I prefer eating the cake as it is as it is already delicious the way it is. Enjoy! 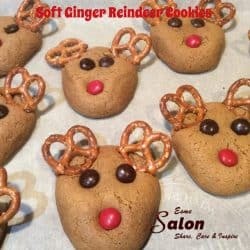 This is a delightful and awesome Christmas cookie for young and old? A first for me, and then I made three of them with some variations each time within a week! 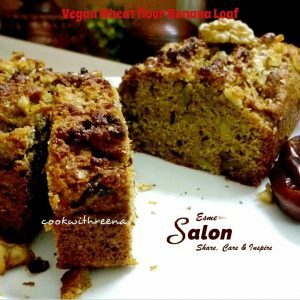 I also made it GF and the last time, I used Nestlé Caramel Treat mixed with some mint essence as the filling – Yumminess. Then, I experimented and just dropped spoons full of batter instead of using the piping method. 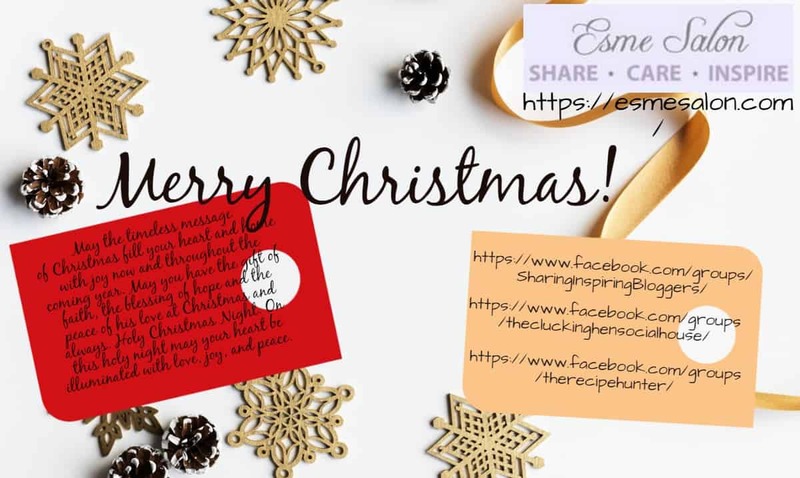 I wish to take this opportunity to thank all my followers, here on the blog, and those via the different FB groups and wish you may you all have a wonderful Christmas / Festive Season! May the timeless message of Christmas fill your heart and home with joy now and throughout the coming year. May you have the gift of faith, the blessing of hope and the peace of his love at Christmas and always. Holy Christmas Night. On this holy night may your heart be illuminated with love, joy, and peace. Ooooh some really good ideas here! Thank you for your contrubution Ellen. WOW what a great collection. 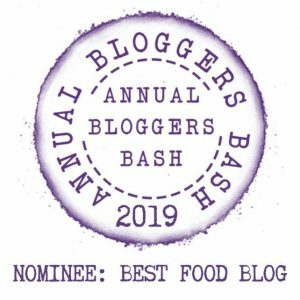 So much to choose from and checking out different peeps blog. Thank you and have a lovely holiday.